It’s quite interesting how you can tell these two apart. And believe me, you’ll be trying it out at home within 30 seconds. The trick to tell a mirror and a 2-way glass apart was reviled by a police woman who travels all over the US and gives seminars and techniques for businesswomen. When visiting a toilet, bathroom, hotel room, changing room, etc., how many of you are sure someone isn’t watching you behind the so-called mirror? There have been many cases of people installing 2-way mirrors in female changing rooms. And it can be very difficult to identify the surface just by looking at it. So, how can you positively determine the type of mirror you’re facing? You can do a simple test. 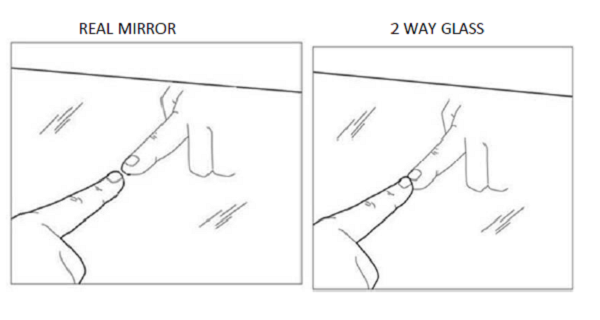 By placing the tip of your finger on the glass you can see if it’s a mirror or a 2-way glass. If there’s a gap between your fingernail and the image of the nail, then it is genuine mirror. 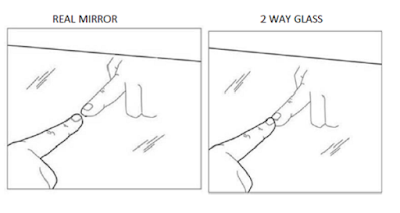 However, if your fingernail directly touches the image of your nail, you’re facing a 2-way mirror.